Bubbles in what? It is not always clear in your discussion. And while bubbles outside property markets are rare; in property markets, not so much. Lorenzo, I am on purpose not clear on that. I think of bubbles as economic wide misallocation of labour and capital. That could be into the construction sector and the real estate market, but that does not have to be the case even though it historically alway have been like that. Bubbles might emerge in many markets, but it is only important if it is having an economic wide impact. Concerning US versus global monetary policy I actually think it might be worth looking at whether global monetary conditions became too loose, while US monetary policy from a strictly NGDP targeting perspective was more neutral. My idea is to have a look at earnings growth in US companies and comparing that with global and US NGDP growth. My guess is that US earnings growth correlate better with global NGDP than with US NGDP and as a result you might have had Selginian relative inflation in the indirect sense in the US despite this not being visible in the US NGDP numbers. Interesting idea, the tough part I suspect will be coming up with a good global NGDP measure at a high enough frequency to do analysis. I made one once before interpolating the IMF’s annual series they occasionally put in the WEOs. I think of bubbles as economic wide misallocation of labour and capital. Surely, bubbles don’t have to be economy-wide: some parts of the US had housing bubbles and some parts did not. Which did and did not is very revealing about the nature of (housing) bubbles. I am also uncomfortable with the notion of ‘misallocation’, given it is clear only in retrospect. It is also rather close to the notion of ‘malinvestment’, a concept I have serious disagreements with. David, I have been using the same global data from WEO. Interestingly the increase in for example global commodity prices correlated quite well with global NGDP so the concept clearly seem to be valid. Does that mean that we are in the midst of a global bubble? I don’t think so, but obviously if we argue that it is a problem that NGDP has fallen well below pre-crisis trend in the US and Europe then we should be equally worried if the there are signs of excessive demand inflation (NGDP above trend and relative inflation) in other countries – primarily Emerging Markets. Lorenzo, I acknowledge that “misallocation” sounds a bit Austrian and to some extent is the same as the Austrian concept of “malinvestment”. What I sketch, however, is not a version of the Austrian business cycle theory even though there are some similarities. Unlike the Austrians I do not believe to be bubbles to be widespread and I do not think that we get “malinvestment” if monetary policy occasionally become overly easy. That said, I do think there is a very clear risk that overly easy monetary policy and moral hazard (implicit or explicit guarantees to investors) can create the wrong incentives to take excessive risk. This does not seems to be like a risk that we should be concerned about in the euro zone or the US right now, but for other countries these considerations might be fully valid, cf. the discussion between David and me on global NGDP. Lets take China, in China there is serious misallocation of capital and labour due government intervention in the economy. The Chinese government quite clearly has helped spur what could be seen as a Chinese property market bubble and the People’s Bank of China (the central bank) has helped this process by sharply increasing the money supply. I am not certain we are in the midst of a economic wide Chinese bubble, but we should certainly not be ignorant to these risks. Finally in regard to bubbles as being economic wide or not my point is that we can have “bubbles” in a lot of market in the sense that investors make the wrong decisions and prices increases more than “dictated” by fundamentals but that is just the nature of things in an uncertain world. Investors make mistakes all the time and that is not a major problem. This mistakes are corrected over time in the unhampered market. Therefore, I only think that economic wide bubbles are relevant in terms of discussion monetary policy – and even here as I stress above – I don’t think that the central bank should be in the business of pricking bubbles. It is only a wrong decision if you get caught (by events). The term ‘mistake’ is ambiguous. There are mistakes where, given the information available at the time, the decision was faulty. And there are mistakes where, given information that subsequently became available, it was the wrong decision. The first imply some sort of culpability, the second do not (at least, not by the individual agents). To me, the key thing about bubbles is that the turning point is unknown prior to the event. If was predictable, people would not be caught by it. So, it creates many mistakes in the second sense, but just the normal proportion in the first. The key story is expectations, not misallocation. Assets are some mixture of income source (bonds are pure income source) and stores of value (gold kept as bullion is a pure store of value). The reason property markets are particularly prone to bubbles is that land can apparently function as a store of value. Once the expectation is set up that it is an inflation-beating store of value, rising prices then feed themselves since they set up expectation-reinforcement-loops. One can get overbuilding in commercial property but housing bubbles are rarely significantly marked by over-building. On the contrary, they are more likely to be a result of (land) supply constraints creating elevated notions of land as (rising) store-of-value. (Hence some jurisdictions can suffer major housing booms and busts — California, UK, Japan — and others much less so or not at all — Texas, Germany.) Housing bubbles tend to have rather more excess debt than labour or capital misallocation. A very good post that touches on issues that I’ve been thinking about recently and makes them much clearer for me. (1) Whether or not there was a rise in relative rise in inflation in the US prior to 2008 depends on the prices that you look at. Prices of consumer goods certainly weren’t out of control. Oil prices were high, but due to unambigious supply shocks. Property prices, stock markets and other assets however did follow a path of rapid inflation from about 2003 to 2005, followed by a levelling off in 2006 and a sharp contractionary phase in 2007-2008. You could call this a boom in PT while PY was growing steadily and sustainably; another term for it would be a “financial boom”, which I suspect will become more common as financial sectors increase in importance. – presumably because sterilising the effects of Fed-originated monetary expansions is politically very difficult. W Peden, thank you for your comments. Your reference to the Bank of England story reminded me that I have actually done some calculations on the split between demand inflation and supply inflation in the UK (based on the Quasi Real Price Index). In the UK it is very clear that monetary policy was excessively loose basically since the early 1990s. There has been very significant supply deflation over the past two decade (thank you Baroness Thatcher!). I think this might very well help explain the strong rise in UK property prices in the “boom-years”. I would also argue that for some assets global NGDP growth rather than domestic NGDP is more important. Take for example the US stock markets – I think global NGDP expectations will do a better job explaining the development in US stocks than US NGDP expectations. That said, I am not sure that global monetary conditions were overly loose just prior to 2008. By the way, I am not sure oil prices really are that high. On should note that while US and Europe NGDP grew fairly strong from 1998 until 2008 (around 5%) that was not the case of most Emerging Markets – especially for the Asian countries. 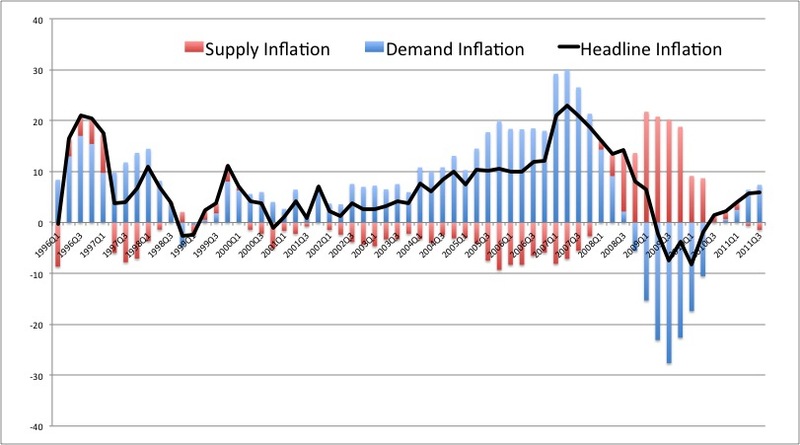 In fact we had demand deflation from around 1998 and until 2002-4. That kept oil prices very low in that period and when global NGDP then started to rebound from 2002 or so oil prices (and other commodity prices) started to pick up. In my view the development in commodity prices can quite easily be explained by global NGDP in the last couple of decades and we can basically ignore supply concerns. I’m surprised to hear that data about oil prices. I suppose they seemed high during the period because (a) the contrast was with the 1986-2003 period and (b) oil in the UK was not getting cheaper while almost every other importable good was getting cheaper. – but I wasn’t aware that there was more solid evidence suggesting that. Unfortunately, the previous government seems to have steadily eroded the UK’s supply-side strengths over the past 10 years. I suppose we usually wish we could have yesterday’s problems! I agree with your point about the effects of global nominal growth on asset prices. It couples nicely with David Smith’s work: the interaction of asset prices, broad money and nominal GDP (not in any particular order) takes place at the global level as well as the national level. Bubbles are almost always due to bank credit creation, fraud & the “miracle of compound interest”. Most credit today is spent to buy assets already in place, not to create new productive capacity. The effect of extending bank credit for assets already in place is to bid up their price. But it is fraud that, by enabling the rapid increase of bank credit, provides the fuel to hyperinflate bubbles. Fraudulent loan origination causes an enormous expansion of bank credit that would otherwise be impossible. Bank credit creation is normally limited by the number of credit worthy borrowers (those able to repay) and can only expand beyond this by making loans to those non-credit worthy borrowers unable to repay. Here the weapon of choice is Accounting Control Fraud. Control frauds cause greater losses than all other forms of property crime combined. The epidemic of mortgage fraud perpetrated by these Accounting Control Frauds was essential to the creation of the largest bubble in history, the U.S. housing bubble.